Last week you asked Andrew Mitchell a number of questions. Here are the Shadow International Development Secretary's answers. Alan S: Given that the United Nations has failed Rwanda and now Darfur, does it not need fundamental reform? The United Nations’ peacekeeping and humanitarian efforts have done much to relieve human suffering; in some areas of the world UN peacekeepers are the crucial factor in creating the conditions for peace and stability. For example when I visited the DRC last month I witnessed at first hand the difficult job that MONUC has done there under very challenging conditions. (For more information on this visit see the footage I recorded on WebCameron. However, these successes have often been overshadowed by a failure to act in the face of humanitarian disasters like the Rwandan genocide in 1994, Bosnia and now Darfur. The UN is too often hamstrung by muddled mandates, Security Council cynicism, chronic deficits in military assets and training—all of which need to be resolved. I therefore agree that change is needed and that Britain, as a permanent member of the UN Security Council, should be the one to show leadership and promote a serious reform agenda. I will be making a speech on 18th June at RUSI setting out my proposals for UN reform. Drop me an e-mail for more information. Oberon Houston: Given the terrible events of the last few days in Darfur - what are you doing in reaction to this? Can we do more, or who is blocking? I am convinced that history will judge us terribly on this if we allow this genocide to succeed. We can certainly do more. Despite four years of misery, the international community hasn't even begun to turn the screws on the bullies in Khartoum. We should strongly support the work of the ICC in holding to account those who’ve been involved in genocide and ethnic cleansing. We need to enforce targeted sanctions against the regime's leaders by freezing their bank accounts and applying travel bans to stop their shopping trips to Paris and London. And we should chip away at the network of businesses and charities that enrich the regime and its members. We also need to see the rapid deployment of a stronger equipped and better mandated international force to protect the people of Darfur. In the meantime, the world must offer full support to the African Union troops who are doing a brave job in very difficult circumstances. The people of Darfur deserve more than another round of toothless diplomacy and bluffing and manoeuvring from the Sudanese Government. 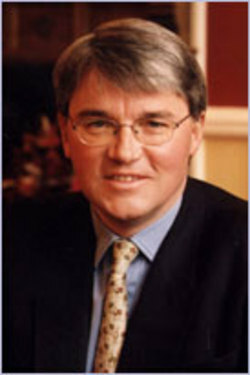 Any questions for Andrew Mitchell? Andrew Mitchell is the Shadow International Development Secretary. He was first elected as MP for Gedling in 1987 and re-elected in 1992 before losing his seat in 1997. In 2001 he was elected as MP for Sutton Coldfield. He was a Whip and Minister for Social Security in John Major's Government. Michael Howard appointed him Shadow Minister for Economic Affairs in November 2003 and in September 2004, he became a Shadow Minister for Home Affairs. Since May 2005, he has served as the Shadow Secretary of State for International Development. He was a leading member of David Davis' leadership campaign. In his current job he has travelled widely in the developing world and has recently returned from Burma and you can watch a video diary of his trip here. You can leave your questions for Andrew Mitchell in the thread below or email them here.